6’+ Episode 44 Is Up! 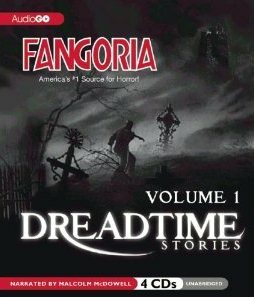 Readers of the 2012 Halloween countdown might remember how I briefly touched on Fangoria’s Dreadtime Stories last month in my most recent installment of “Fear For Your Ears.” Said series is the result of Fangoria teaming up with the man behind The Twilight Zone radio series in 2011. Featuring narration by Malcolm McDowell and music composed by Fangoria editor in chief Chris Alexander, the series is broadcast via rotating streaming episodes on the Fangoria website and on Sirius XM. However, those options are less than ideal for those who have specific episodes they want to listen to. Thankfully, AudioGo has the series available on both CD and digital download. Not only that, but these releases feature extended versions of said episodes! Although consumers are most commonly compared to zombies, “The Late Shift” (based on Dennis Etchison’s classic short story) opts to turn its attention to cashiers and offers a chilling explanation for their worn down demeanor. In “Reincarnal,” a party game involving hypnosis leads to a young woman named Nora experiencing a teenager’s death at the hands of a deranged killer in the 80’s. But as similar murders start happening, she starts to wonder if she’s actually the reincarnation of the girl in her vision. Now Nora has to both search for the truth and for a way to bring the murderer to justice. Have you ever heard of Cordyceps unilateralis? It’s a type of fungus that can infect ants and control their brains! These “zombie ants” behave strangely until a spore bursts out of their head. Thankfully, this fungus has no effect on human beings. “A Fungus Among Us” shows us what happens when the previously stated comforting fact no longer holds true. “Wolf” puts a new spin on the term “lady killer,” thanks to its focus on a handsome werewolf whose worldwide hunt for young flesh brings him to a lodge resort. “Living Space” finds an apartment-hunting couple trapped in a locked room with moving walls while “A Good Head on His Shoulders” deals with the connection between a killer who mutilates people in the medical profession and the mafia (along with the story’s connection to a horror classic).